AUSTIN —State Representative Ryan Guillen (D-Starr) was recognized as a friend and supporter of the Texas Deer Association (TDA), a non-profit organization in Texas dedicated to improving the quality of Texas deer herds. 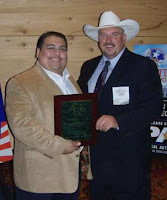 Rep. Guillen was presented the award by TDA President David Hayward at TDA's annual convention luncheon on Aug. 12 in San Antonio. "Deer breeding and hunting in Texas are multi-million dollar industries that positively affect our state's economy and attract avid hunters and wildlife enthusiasts from across the world and creates jobs." said Rep. Guillen, Chairman of the House Committee on Culture, Recreation, and Tourism. "It was a pleasure working in conjunction with the Texas Deer Association during the state's past legislative session to ensure an even brighter future for these important industries." The Texas Deer Association's primary goal is to increase quality hunting opportunities for all Texans. To achieve this goal, the TDA advocates wise management practices, promotes research and technology regarding improvements to deer herds through the practice of controlled breeding, and recognizes that hunting and wildlife management are lifelong enterprises. For more information, please visit http://www.texasdeerassociation.com/.